We started our day 2 driving towards Kudalasangama. 49kms from where we stayed. It was a sunny day. Kudalasangama is the place where Basavana preached and more information is here http://en.wikipedia.org/wiki/Kudalasangama. Rivers Krishna, Ghataprabha & Malaprabha merge at this place. Hotel Kamat for breakfast where Suhas became busy reading out the Vachana’s of Basavanna. 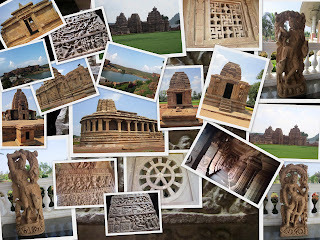 Starting with School of Carvings – Aihole. Place which boasts for having 125 different variety of Chalukyan temples. There are stories behind each one of these temples. After the kings rule, each of those 125 temples were occupied by the 125 different families due to which each temple is named after those who stayed there. Patadakallu was our next destination. I remember taking guides in every place visited this day as it otherwise would have been just the same red rocks brought down into caves n temples or a creative structure built up to delight ones eyes. Beauty of each carving can be enjoyed only by understanding the story behind it. 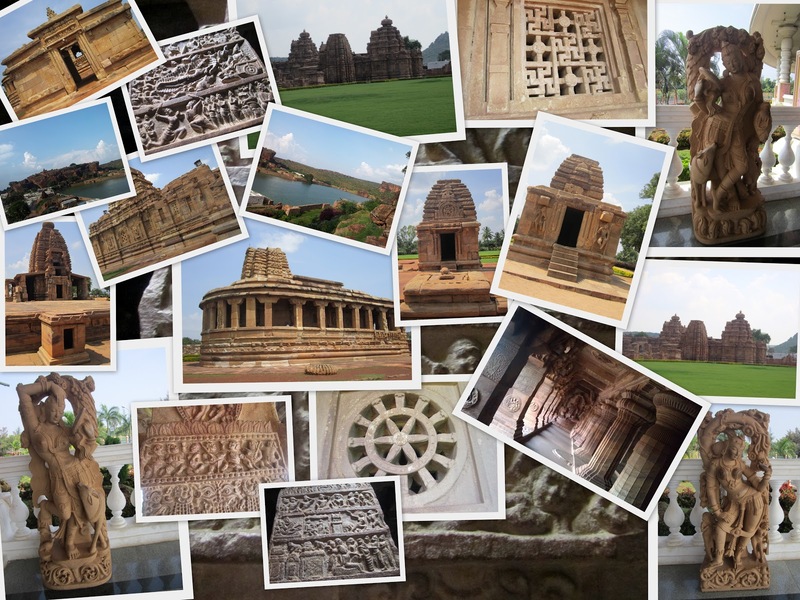 I personally liked every single structure which stood in this region of north karnataka. The fort built surrounding the city, those uniqueness in each temple and the wonderful story behind it. Worth travelling all the way to explore our rich culture n heritage. 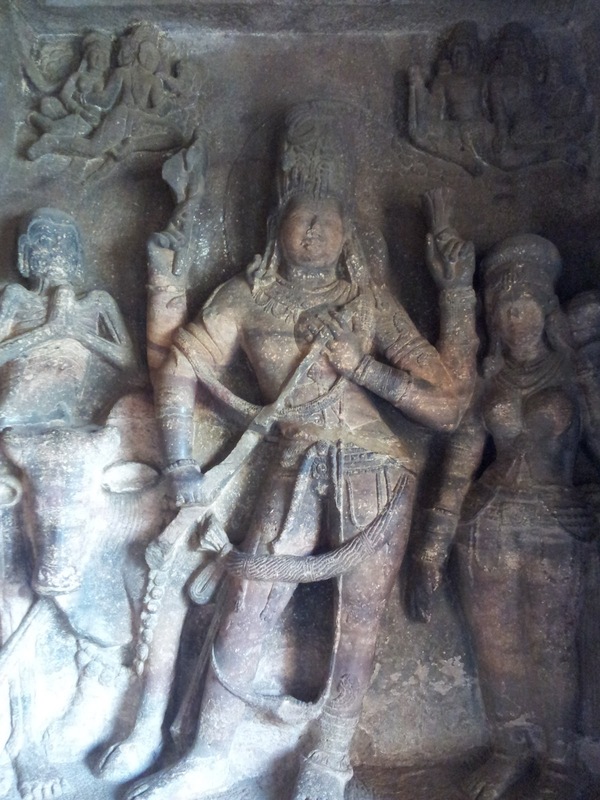 One particular carvings in one of these caves was the one with a beautiful lady on one side of ShivaParvathi & a skeleton on the other side giving out a message needless to be told. Similarly there was this Swasthik carving on the sealing which is superb. The last cave has the Jain god Mahaveera statue. After a long time … yet another trip which gave me a hangover. Lost myself at the sight of Badami Caves, Gol Gumbaz and several other places around Bagalokot & Bijapur. The idea of visiting Badami Caves & Golgumbaz had come to my mind when we were studying about these historical places back in our school. Bijapur Express tickets till Badami got booked for 12 people. Only 10 of us finally boarded the train almost at the nth moment on Friday evening. Sindhu, our new member in the team had just made it to the train. Train journeys are always fun. The team made noise even after being warned by a co-passenger. We were unstoppable. UNO, jalebi and a couple of small small stories from Suhas. Pooja joined our team in Gadag. She is this cute lil Jo’s cousin who became our fav by the end of the trip. Trains as expected reached Bagalkot half an hour late. We all sipped a nice cup of tea in Jo’s relative’s place. Reached our hotel Durga which was 12kms away from the city towards Hubli. 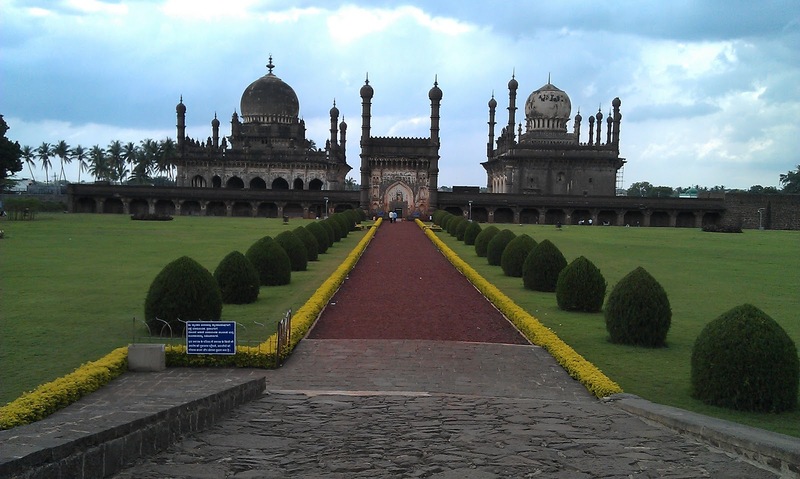 After a quick round of changing, team was ready for a 70kms drive to Bijapur. The first place we visited was Ibrahim Rosa. Very fantastic architecture adding to its beauty is the well maintained garden. 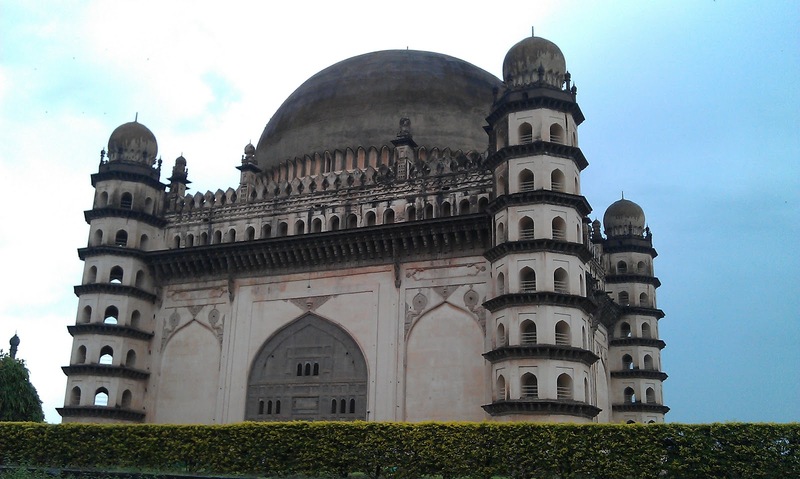 The namaz read on of the tombs is very clearly audible on the other tomb. (Wow just when I am writing this… I can hear the Namaz. Yeah its 6PM & I am in my office …I love listening to it!!!) Rains dint spare us. Few enjoyed it. Our dear Radhika was ill by this time. She seemed very amused by the idea of taking an injection and getting well soon. I feel like running away from the very thought of tablets.. far is taking an injection. Hmm… Reaching back to Bagalkot by 7:15PM to watch the light show in Almati dam. I wish we could have gone during day, it had a really good garden as Suhas suggested. Atleast for few good snaps.